Hello, I wouldn't say this isn't a bug at all, but upon playing a chart called "Ant IDM" by The Flashbulb, I noticed the steps are very offsync by around 2.3 ms compared to a typical synced FFR song. If you can correct this, that would be cool. Thanks. It seems that with the "Reactive Tapping" mod, the effect of the up and down arrow are swapped. Currently, when you press the up arrow, the receptors move down; when you press the down arow, the receptors move up. 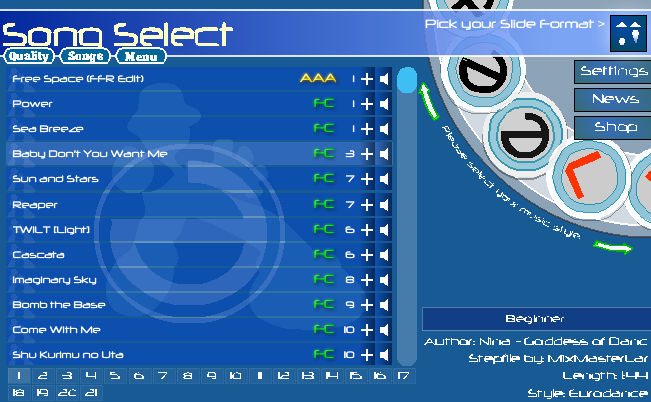 The only way I can fix this problem is by AAA'ing the song again, even if I've already AAA'd it. EDIT: Also noticed that Death Moon  is not placed in the right spot on the Dance 2 category on the same engine. Might be the same deal with the other engines. Last edited by ULTIMEGA; 11-29-2016 at 10:16 AM..
Last edited by PrawnSkunk; 12-3-2016 at 06:12 PM..
Also fixed this deeply pressing issue. hey guys, the recent achievements thing on the front page isn't working properly, i just got promoted to d6 but it doesn't show up on the achievements and milestones list, which still says i'm d5? Thanks butts. I will be looking into that this week. edit: Click here for a small december engine update. Last edited by PrawnSkunk; 12-17-2016 at 06:04 PM..
1. In R^3, when looking for songs by Song Flag and selecting the "All" group, the songs are ordered by song ID instead of difficulty. Can this be solved? 2. SmexxxyBeast asked me about something and I promised him I was going to ask hahaha. What is the logic for the username color in R^3 multiplayer?? If it's by usergroup, we think that the logic for Veteran is outdated (using the old time requirement instead of the new Time x Grandtotal). The arrows are all garbled into the wrong orientation when viewing a recent replay. I played this left scroll on Legacy and the Recently Played section on the front page had a watch replay option, so I clicked it and this happened. That's not even just taking the orientation of the arrows for upscroll and turning them 90 degrees counter-clockwise, so I have no idea how this happened lol. I don't know if that link will work, or if I need replay tabs around it or whatever, but yeah. This had me laughing at how weird those arrows look. I noticed that recently in the levelranks, that there are unplayed songs that say I have rank 1. A checked a few of the release dates and they seem to be relatively newer files. The older unplayed files have ranks other than 1 (which is supposed to be the case). I'm not sure if this is throwing off the average rank calculation in the levelranks page or not. Last edited by reuben_tate; 01-20-2017 at 11:41 PM..
Yeah, it's called ghosting. Keys doesn't register properly with certain configurations on keyboards. Hi, not sure exactly where to put this, so it goes here, I guess. I joined yesterday mainly just to play TWG here, but never got the usual email verification message. Is this normal? Hi there. We have received other reports like yours this year, and we are currently tracking down the issue. In the mean time, I have manually verified your account email. http://www.flashflashrevolution.com/...y/ffr_Wide.swf < going to this link will start a download for ffr_Wide.swf for some reason. Will not load. EDIT: So after digging around on the standalone wiki I notice the link as well. Does this mean that velocity_wide has been moved to standalone only ? updated lol again http://www.flashflashrevolution.com/...cale=noZombies also starts a download when you click the profile chat from drop down menu on front page. Last edited by kurisushadow; 02-22-2017 at 05:05 PM..